Wallabies star Israel Folau has revealed he offered to walk away from his Rugby Australia contract in the wake of his controversial comments on homosexuality and that tension remains with the game's administration over the issue. The Wallabies fullback wrote a lengthy piece on sports website Players Voice, addressing the fallout from his Instagram message and reiterating his deep religious convictions. Folau said that in a meeting last week with RA chief executive Raelene Castle and Waratahs CEO Andrew Hore, he gave his bosses the option to sack him. 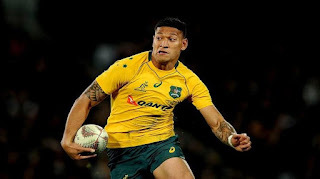 "I told Raelene if she felt the situation had become untenable - that I was hurting Rugby Australia, its sponsors and the Australian rugby community to such a degree that things couldn't be worked through - I would walk away from my contract, immediately," Folau wrote. Folau, who is off contract at the end of this season, rubbished claims that the inflammatory social media comments was designed to ensure he got a release from RA so he could move back to rugby league. "This is not about money or bargaining power or contracts. It's about what I believe in and never compromising that, because my faith is far more important to me than my career and always will be," he said. But before Castle attempts to negotiate a new deal for Australia's most potent attacker before next year's World Cup in Japan, she will need to resolve the friction Folau still feels remains over the social media saga. "I felt Raelene misrepresented my position and my comments, and did so to appease other people, which is an issue I need to discuss with her and others at Rugby Australia," wrote Folau. Following last Tuesday's meeting, Castle conceded that it was a difficult issue "trying to combine religious beliefs, freedom of speech, inclusion, respect and the use of social media". But now Castle and Folau seem to be in a stand-off, with the 29-year-old in- demand star repeating his devotion to the Bible's words. "At times, you can feel alone and down. But Jesus told us that when you stand up for Him in this world, you can expect backlash. I find peace in that," said Folau. Folau's original message on Instagram, which was deleted soon after, said that god's plan for gay people was "HELL".